Spotify is a game-changing music streaming service used by millions, available via a monthly subscription or a via an advert-supported free version. Although the list of countries is extensive, you will be blocked in locations where the service is not supported. We’ve reviewed which VPN for Spotify brings you the smoothest, fastest, and safest Spotify music experience, whether you’re listening to Spotify on vacation abroad or live in a region which Spotify doesn’t support. ExpressVPN performance makes it our top VPN to unblock Spotify anywhere. For a list of all 58 supported countries where Spotify is supported, click here. Spotify’s agreements with the owners of music copyrights only cover certain parts of the world. As part of its agreement, Spotify is legally required to geo-block listeners using Spotify abroad in countries where it doesn’t own the music copyright. But just like getting Netflix unblocked, there is a solution. 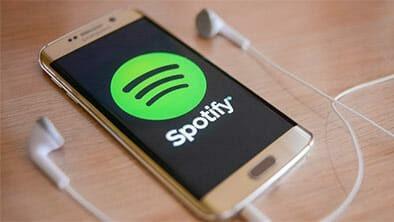 Would-be Spotify users can still enjoy Spotify’s 20 million songs by using a VPN for Spotify. A VPN encrypts your web traffic and then redirects it through one of its servers anywhere in the world, including one of the many Spotify countries where the service is available. This way, a VPN hides your real IP address so that Spotify can’t recognize your location in an unserved country and block you from accessing its service. You might want to use a Spotify VPN even if you’re just using Spotify on vacation. Spotify permits you to change your country profile using Spotify Change Country so that you can continue enjoying the same music when you travel. But, you can only use Spotify abroad for 14 days. After that, you’ll have to find something else to listen to or turn to a VPN for Spotify. With one of the VPNs reviewed below, you can enjoy Spotify unblocked without restrictions or obstacles, whether you’re using Spotify on vacation overseas or you live outside of the Spotify countries. With all the VPN contenders available in the market, we’ve reviewed which VPNs will, in fact, unblock Spotify regardless of your location and give you a seamless listening experience worldwide. We didn’t mean to give the game away so soon, but we just can’t help it. ExpressVPN is our vote for the best VPN for Spotify. With 145 servers in 94 countries, you are sure to find one that is close to you. Its simple setup makes it easy to get Spotify unblocked, while round the clock support solves any problems that pop up no matter what time zone you’re in. Its high level of encryption and security guards your password, personal details, and credit card information against prying eyes too. ExpressVPN works at high speeds, so your music experience won’t be marred by pauses, delays, or buffering time. As well as a reasonable pricing structure, ExpressVPN offers a 30-day free trial. Check out our ExpressVPN review and Sign up with ExpressVPN here. Surfshark is suitable for use by those that want a safe and secure way of accessing Spotify on the net for all manner of reasons. One of the features that make it ideal for music streaming is its large network of servers. It has over 800 servers in over 50 countries which means that you can access Spotify’s content wherever you are, whenever you like. It also means that you can unblock any content that may be restricted to you depending on your location Additionally, it has many security measures in place that keeps a user’s identity anonymous. Features like a kill switch, top of the range encryption methods and a strict no logs policy, all work in tandem with each other to ensure a user’s continued privacy. Check out our Surfshark review and Sign up with Surfshark here. Another great Spotify VPN, NordVPN’s super-fast streaming and download speeds allow you to enjoy Spotify without annoying breaks in the music. Over 1,000 servers in 60 countries across the world and unlimited streaming and downloads mean that you’ll always be able to unblock Spotify and enjoy fast, secure, and pause-free music. NordVPN’s prices are highly competitive and are accompanied by a free 30-day trial period. Check out our NordVPN review and Sign up with NordVPN here. If you want to unblock Spotify, you should consider Hotspot Shield as one of your top options, as it is known for unblocking content without any troubles. Additionally outside of the US, Hotspot Shield performs at ridiculously fast speeds. Encryption, however is not really a strong suit for this VPN. If privacy doesn’t play an important role in why you want a VPN, and you basically just want a VPN for streaming, this is probably the best option out there. Other features Hotspot Shield has include: Wi-Fi protection, apps for Windows, Mac OX X, Android and iOS, kill switch, five simultaneous connections, the ability to switch languages within the app and no data limits or bandwidth limits. Check out Hotspot Shield Review and Sign up with Hotspot Shield here. Using Spotify abroad is easy with PrivateVPN. The 24 hour a day, 7 days a week customer support is always available to help if your music stalls, even if you’re on the opposite side of the world. It’s compatible with iOS and Android, and you can switch your location as often as you’d like, so even if you’re traveling around the world, you can take your music with you on your smartphone, uninterrupted. PrivateVPN invites users to try it out for free for 30 days and gives you a money-back guarantee if you aren’t entirely satisfied. Check out our PrivateVPN review and Sign up with PrivateVPN here. IPVanish lets you listen to Spotify worldwide without throttling, lag time, or any restrictions on your music experience. It’s compatible with every device, including iOS and Android smartphones and tablets, so you can enjoy your favorite playlists wherever you go. IPVanish’s 256-bit AES encryption protects your password and credit card information when you use Spotify. IPVanish offers a 30-day free trial. Check out our IPVanish review and Sign up with IPVanish here. PureVPN is an extremely effective Spotify VPN. It has a simple, straightforward setup procedure and is compatible with iOS and Android. Servers on every continent give you a full choice of where to place your IP location when using Spotify abroad. PureVPN will automatically search out the fastest server available each time you use it so that you can listen to your music without pauses or lag time. PureVPN is the lowest-cost Spotify VPN that we reviewed, but it has only a 7-day money-back offer. Check out our PureVPN review and Sign up with PureVPN here. Cyberghost is one of the top VPN providers on the market. With over 1,000 servers to choose from in many different locations worldwide, you will have access to all types of online content. They have a zero-log policy, so you never need to worry about them using or selling your data. They even have a kill-switch, just in case your service does cut out, you can rest assured that you are covered. Cyberghost is a well-priced VPN, and it has a 60-day money-back guarantee, which is 30 days more than the typical VPN provider. Check out our review and Sign up with Cyberghost here. Enjoying Spotify unblocked isn’t the only benefit to using Spotify with a VPN. A VPN brings a host of security features that include a high level of data encryption and advanced firewalls. This keeps your password, personal details, and credit card information safe from hackers who could be trying to steal your data over public Wi-Fi connections and protect your music choices from spying eyes. The best VPN can bring you faster streaming by bypassing local throttling speeds, so there’ll be no pause between one song and the next. It’s even worth using a VPN for Spotify when you’re in a country where Spotify is available directly. Just check out our reviews and start using Spotify wherever you are. I have NordVPN, but I don’t see how to bypass Spotify restrictions of region locked content. You need to make sure that you have your VPN set to an IP address within the United States. Once you are located somewhere within the country, you should be redirected to Spotify’s US site.